Our Kids are a huge part of what we do at Crossroads and we want for other kids and families to experience God’s love for them! We’re planning on having VBS here at Crossroads in the Summer and we’d love for you to be a part of it! 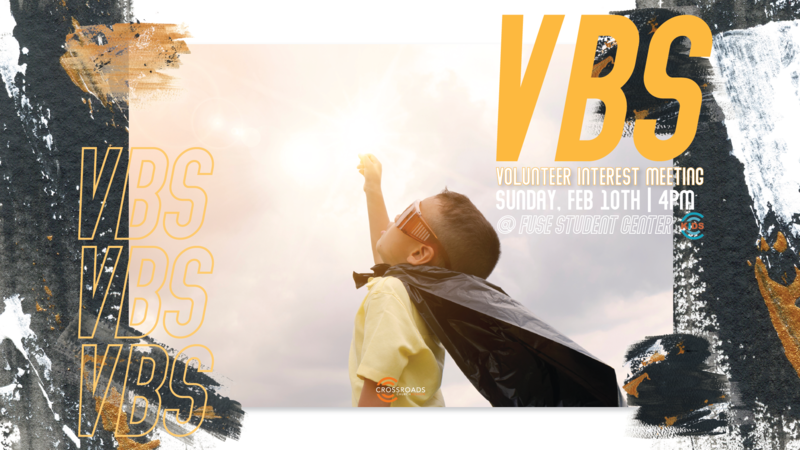 If you’re interested on volunteering or give your time with your skills in the preparation process, then come on Sunday, February 10th for our Volunteer Interest Meeting and find out more about this exciting event. It takes a big team to put a VBS together and we know God will use YOU with the gifts He’s given you to bless others. We will only be able to move forward if there is a large, committed group of people willing to participate and make it the best it can be. If you’re interested or would like to sign up for different areas, please fill out the form below and we will be in touch with you soon. We’re so excited and cannot wait to see what God has in store for us!